To a law geek like The Legal Genealogist, a lovely word. And it’s a word, I suspect, most of us misuse just a wee bit on those occasions when we do use it, depending on time and place. I mean, when you think about how mayhem is defined in early American statutes — as, for example, in Indiana law, where you would commit mayhem if you were to “unlawfully disable the tongue, put out an eye, slit the nose, cut or bite off the nose, ear, lip or other member of any person, with intent to disfigure or disable such person”2 — how could it be anything other than a crime? 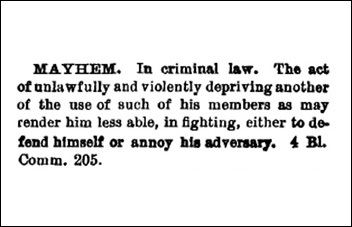 But Blackstone went on, and — of course — we’re all going to read right along with him3 — to find that the definition we’re used to from those early American statutes isn’t really what mayhem was, originally. That slitting the nose, bitting off the nose, biting off the ear bit? Not part of the original concept of mayhem at all. Got that? Originally it didn’t include plain old ordinary disfigurement at all. With little twists in the meaning depending on the time and the place. A little different from the “Mayhem” of the auto insurance variety!